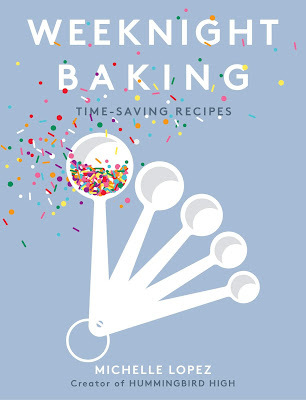 One of the things that I'm quickly discovering about the cookbook writing and recipe development process for Weeknight Baking is that the simplest, most classic recipes are often the most tricky. Developing a shortbread cookie recipe gave me a whale of a time; as did boxed mix brownies. 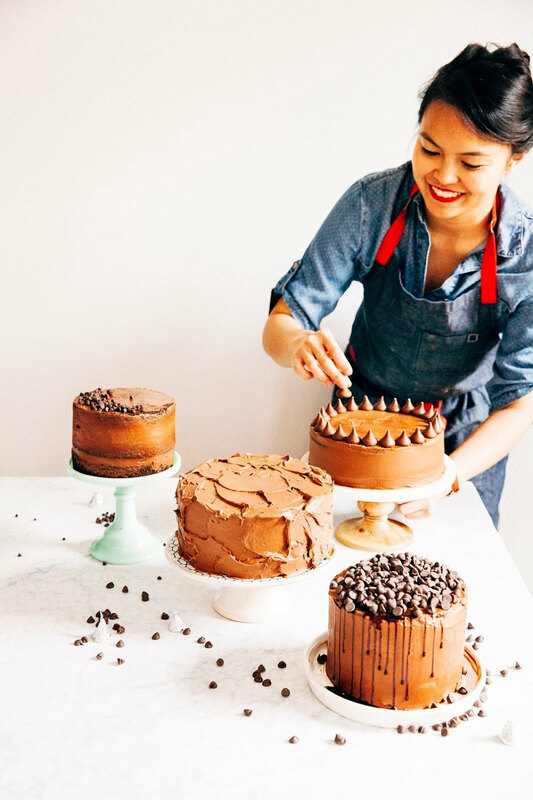 But black sesame sugar snickerdoodles and birthday cake blondies? Nailed it, just like that. 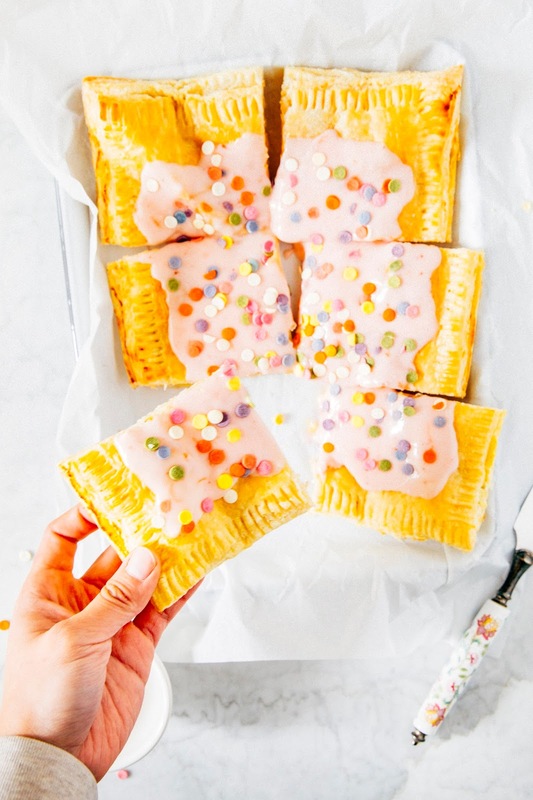 And when I set out to develop a homemade pop tart recipe many, many months ago, I thought that it'd be a breeze to do so. I was using store-bought puff pastry after all (unless you're a professional baker, I'm not a believer in making your own from scratch — because who is that masochistic/has time for that? ), so how hard could it be? Famous. Last. Words. Because it was surprisingly tricky to do so! I seemed to have developed a mental block on how to seal the puff pastry properly. No matter how many times I made it, filling would leech out and turn into a sticky hard candy at the bottom of the pan, gluing the puff pastry in the process. I eventually figured out that I was using way too much filling (I'm all about filling, okay?!) and my method was pretty much all wrong. I was spreading the filling all the way up to the pastry's edges, which is what I do for cinnamon rolls to make sure I have even, fluffy buns with each cut. But that doesn't work for puff pastry — you have to leave a border to prevent the filling from spreading out. I'm not going to tell you guys how many times it took me to figure that out, but know that it was way more than it should have taken and many, many expensive sheets of puff pastry ruined. But no matter. Here we are with the mega pop tart of my childhood dreams. I used the best puff pastry I could find (Portlanders, check my baker's notes for the source!) and made a tangy curd with the key limes leftover from when I was developing a key lime pie recipe for my book. All topped with strawberry glaze and the cutest sprinkles, of course. Enjoy! For this recipe, I scaled down one of my favorite lime curd recipes (as seen in these lime tartlets) and used the entire batch in one puff pastry. As I've already mentioned though, I like my tarts/pies/anything stuffed with a TON of filling. You might find one batch too much for your taste, especially since the curd itself is a little on the tart side. No worries! Use as much as you want and store any extra in an airtight glass jar in the fridge — it'll keep for about a month. You can make the curd in advance (I made mine a day ahead), but pro-tip: the key lime curd uses one egg yolk, and one egg wash is needed for the puff pastry. So be sure not to throw out the extra egg white! In a pinch, you can use regular lime juice in place of key limes. I'm not sure how puff pastry is sold in other countries besides the United States, but here, it's usually sold by weight as one giant sheet that you unroll or a couple of sheets that are about 10 x 15-inches in dimension. 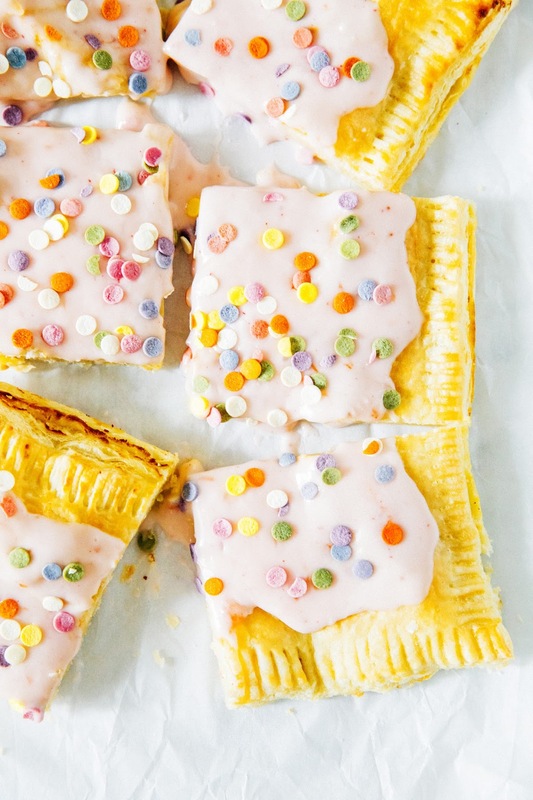 You'll need about 1 pound (usually, 1 box = 1 pound) of puff pastry for this recipe, or enough to make two 9 x 13-inch rectangles. And if you live in either Portland or Seattle, I really recommend sourcing Grand Central Baking's puff pastry. It's the best there is and is so well layered that it puffs like crazy in the oven. 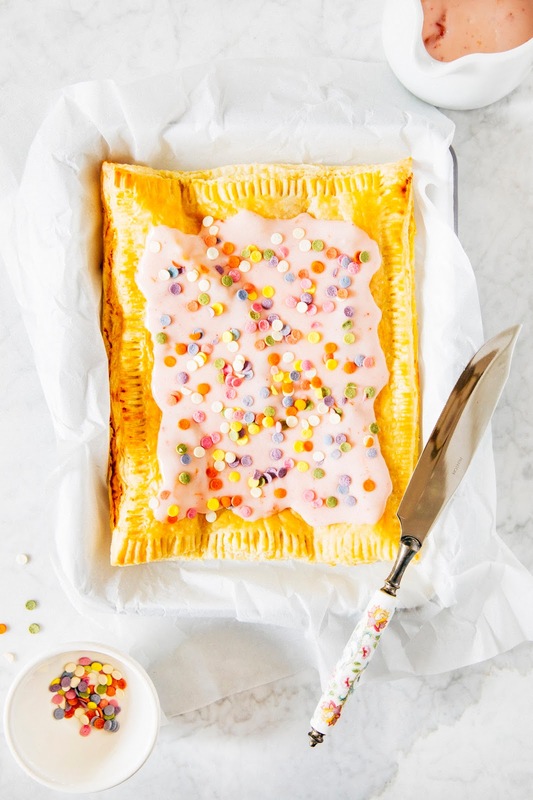 The pop tart is best warm as it tends to deflate and get soggy overnight. In a large glass bowl (see baker's notes), whisk together 1/4 cup key lime juice, 5 tablespoons granulated sugar, 1 large egg, 1 large egg yolk, and a pinch of kosher salt. Nestle the bowl on top of a sauce pot filled with water to create a double boiler — make sure the bottom of the bowl does not touch the water. Place the pot over medium heat and cook the mixture, whisking constantly, until the mixture thickens and registers 172 (F) on a candy thermometer. Once the mixture is ready, it should be able to coat the back of a wooden spoon and your whisk should leave a clear trail through the curd. When the curd is ready, remove mixture from heat. Let cool to 140 (F) on a wire rack, whisking occasionally to release heat. When the curd has reached 140 (F), add 6 tablespoons unsalted butter, a few cubes at a time, and use an immersion blender (see baker's notes) to blend until the butter dissolves completely after each addition. This will take longer than you think it will, and the cream will start to turn into a pale yellow with a thick, opaque texture. Once all the butter is added, allow the curd to cool to room temperature before placing plastic wrap directly on the surface of the cream (to prevent a sin from forming). Refrigerate until well chilled, at least 2 hours. Center a rack in the oven and preheat to 400 (F). Line a half sheet pan with parchment paper and set aside. In a small bowl, whisk together 1 large egg white and 1 teaspoon water until well combined and set aside. Roll out two puff pastry sheets on a lightly floured surface and use a sharp knife to slice each sheet into a rectangle approximately 9 x 13-inches wide. Transfer one of the rectangles to the prepared sheet pan and use an offset spatula to spread key lime curd across the rectangle, leaving a border of around 2 inches around the edges. Carefully transfer the second piece of puff pastry over the key lime curd, creating a key lime curd sandwich between the two puff pastry sheets. Use a lightly floured fork to make indents along the border of the puff pastry to seal the two puff pastry sheets together. When finished, use the fork to prick holes in the center of the puff pastry rectangle. Return to the whisked egg white mixture and use a pastry brush to cover the puff pastry with the mixture, including the edges. Transfer to the preheated oven and bake for 20 minutes, or until the pastry is a golden color and the center is completely puffed and brown. Transfer to a wire rack to cool for at least 20 minutes before glazing and serving warm. In a medium bowl, combine 1 1/2 cups confectioners' sugar, 2 tablespoons warm water, 1 tablespoon strawberry jam, and 1/2 teaspoon vanilla extract. 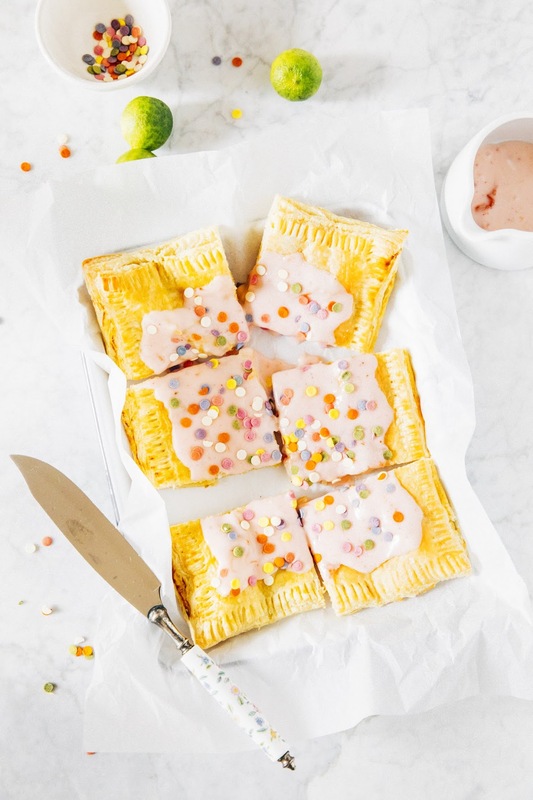 Use a rubber spatula to stir until a thick, pale pink paste forms — the glaze needs to be a little stiff to hold its shape on the pop tart. 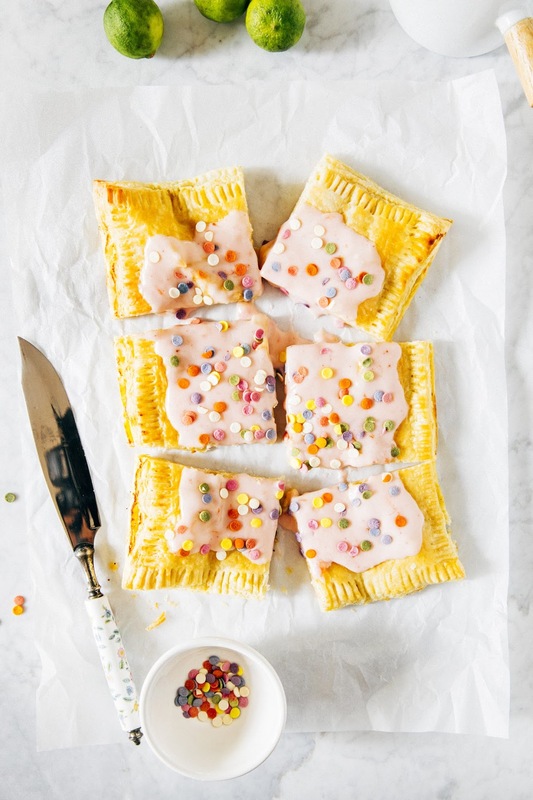 Immediately spoon the glaze on top of the pop tart and garnish with sprinkles.